The Road Less Travelled: This was a picnic kind of a weekend! This was a picnic kind of a weekend! Today was our all church picnic/potluck. 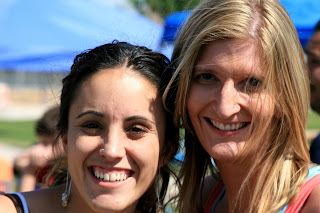 The weather was perfect, the kids had a blast, and David captured a lot of great pictures. He has one amazing eye that husband of mine. He bought me the spendy camera and he steals it 80% of the time. David and I are youth leaders at church - naturally Silas has his own "groupies" partly in short because he's our kid but largely because he's just so funny and demands these teens do what he says. Its rather comical. Today was no different. He was hollering at Josh to take him here and there and everywhere. Its pretty neat to see a tough kid melt and do just about anything one small three year old asks. He even let Silas have his hat! 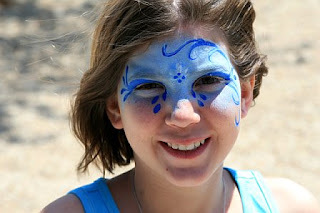 The kids played games, ran off all their extra energy, and even got their faces painted! It was great to hang out with friends, watching the kids play, and enjoying many of Silas' firsts. First face painting! A cool spider on the cheek! 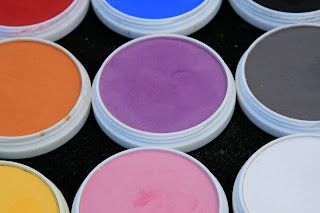 All the kids had their faces painted. I love how much this shows each of their personalities. Silas played ball with our pastors daughter. Fun was had by all. Even the geese had fun. Tired, dirty, ready for a nap and a little burned we headed home. What a fun and busy weekend!!! Fun stuff! I am a little envious of your sunshine!!! Can't wait until spring makes it way here for good! We love all of the pictures and are happy to hear that you all had a great day! BTW-my husband steal the camera from me all the time also! Must be a guy thing. We feel the same about you guys. Don't you want to move to the east valley??? We'll just have to make the effort to meet in the middle! It's worth it when God is in it and everyone gets along so well. We'll plan to get together soon. 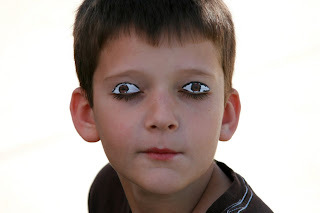 Wow, I have never seen painted eyeballs. Cool! It looks like you guys had a fun, fun weekend. I'm so jelous that you can actually go outside. It's pouring rain here in Oregon. It makes for muddy picknic's! Those pics are too funny. 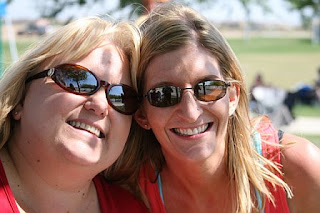 Thanks to paparazzi David, we are all able to look back at the church picnic. Thank you pinky! I told Tammy, too bad we didn't get one of the 3 of us as well, that would have been cute! Joshua says WooooW there are 2 Ericas and only one Sarah and one Tammy. 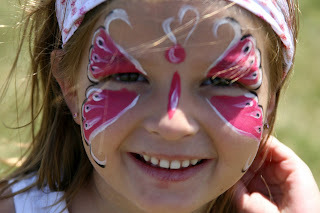 love the face painting... very profesh. The eyes are freaky weaky though. How FUN is all of this! Love it! I am WAY jealous of the sunglasses. I'm thinking when you arrive here in June that you still might need a winters jacket at the rate we are going uhhhhhhhh! 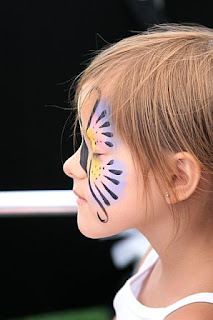 Love the face painting! and the eye balls - WEIRD!